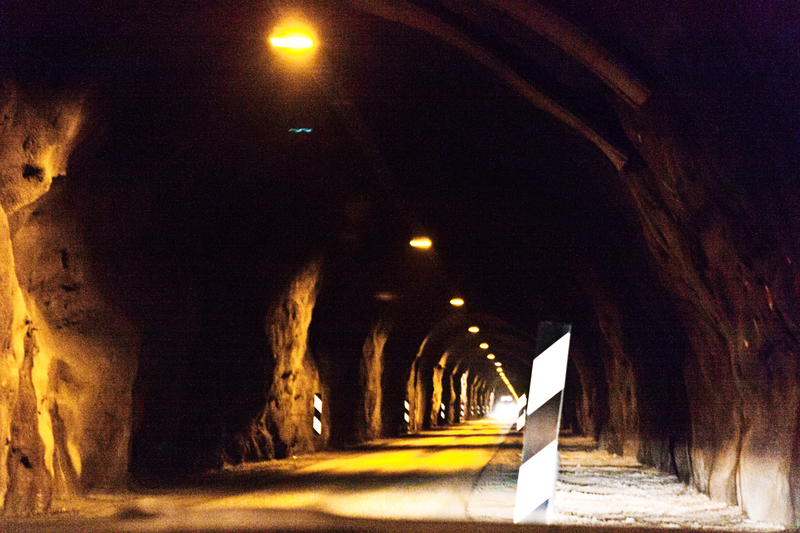 The weirdest tunnel I have ever been in we came through on our way through the Westfjords when leaving Ísafjördur. The tunnel started out as you expect a tunnel to behave. Then all of a sudden, the tunnel split into two directions. You just don't think, that roads underground, under a tall mountain would ever do that. Well, the building of the tunnel was so much work in that hard rock that for the most part of it, it was a one lane drive. We were the unfortunate side: We had to get out of the way every time someone came the other direction. And that happend a lot, for whatever reason. You don't believe this tunnel exists? Check it out on the map! Here is a photo of our drive and you can see a truck coming up to us. We found out it is really hard to judge how close a vehicle is and how fast it is coming if you have no real reference point and no guage. Please excuse the lack in photo quality. I was more focused on not getting hit by a truck and not losing my tunnel vision. I didn't want to keep the story from you, though. We were there in the summer of 2009.